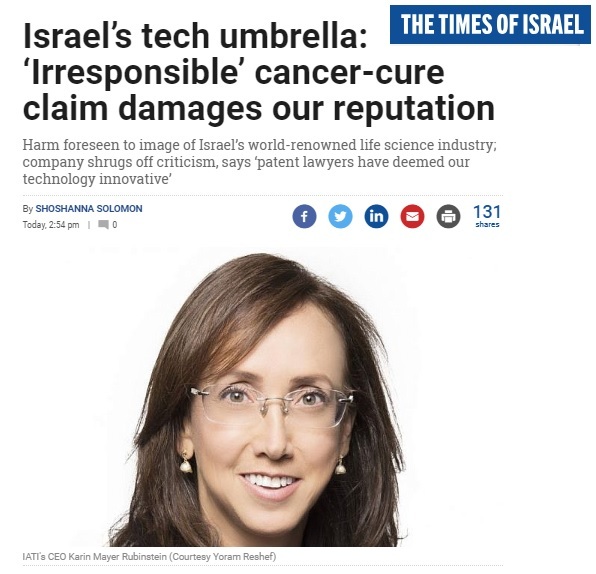 The umbrella organization of Israel’s high tech and life science industries has slammed as irresponsible and damaging a claim by a team of Israeli researchers that they developed a concept that will pave the way to a cure for cancer. “We welcome all companies that develop breakthrough technologies,” Karin Mayer Rubinstein, the CEO of the Israel Advanced Technology Industries (IATI), told The Times of Israel on Thursday. But, she warned, “The things the researchers have said have damaged the image of Israel’s life sciences industry.” IATI is the umbrella organization that represents Israeli high-tech and life science companies, VCs, multinational companies operating in Israel, incubators and tech transfer arms of Israeli academia. Read the full story on The Times Of Israel.